If you read the blog on Monday you will know all about my adventures to Miniatura last weekend and how I'd had the chance to meet some lovely mini makers face to face. Among the lovelies was Leanne Bartlett, owner and creative director of The Contemporary Home in Miniature. 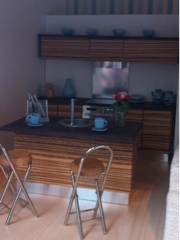 We were greeted with a smile, a chat and invited to take some snaps of the gorgeous, contemporary style houses on show. Now, I've always favoured traditional style dolls houses, I'm not a stickler for historical accuracy or anything but there's always been something quite charming to me about an oldy worldy style house. I LOVE modern miniatures for interiors but have still stayed on the side of Georgian/ Victorian exteriors, probably because that's the sort of house I've lived in in real life? This combined with the fact that a lot of the more contemporary houses I've spotted previously don't always appear that convincing has meant I've not really investigated the more modern side of dolls house architecture before. Well... after getting up close and personal with these little houses I think I may be on the turn!! Leanne has personally designed each house in the range, they are then brought to life by her Dad, Barry Palmer. Each property is finished to a high spec and arrives with it's owner built and ready to move into. Of course the houses on show at Miniatura were filled with modern mini treasures, including fab fitted kitchens by Elf Miniatures and essential, finishing touches from Leanne. It's hard to pick a favourite but I did take a shining to The Water's Edge. I LOVE the layout! Features such as using space under the stairs and the kitchen extension make the layout really unusual compared to the more traditional designs on the market, while the exterior is a refreshing change in style to more commonly favored, historical houses. 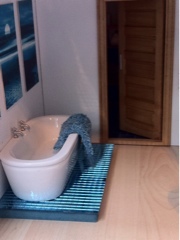 Images used by kind permission of The Contemporary Home in Miniature. The price was also a pleasant surprise, proving that a handmade, British produced house doesn't have to come with a price tag to make your eyes water. If when I have the space and pennies for another addition to my mini property portfolio I think Leanne will be the lady to call! More Miniatura makers to come. In the mean time decorating of my own little house continues following some exciting deliveries this week. All will be revealed soon! !